We wouldn’t want to leave all you sweet tooths out in the cold now, would we? That’s why we’ve introduced Barrett’s Ridge Chocolate – a mix that allows us to add beer bread to starters, mains and now also desserts. Pour entire contents of Barrett’s Ridge Chocolate into a bowl. This particular beer bread mix can double-up as a brownie mix. Simply swap your standard loaf tin for a shallow baking tray and cut the chocolaty end-product into even squares. Perfect as a dessert served with ice cream and ideal for lunch boxes. 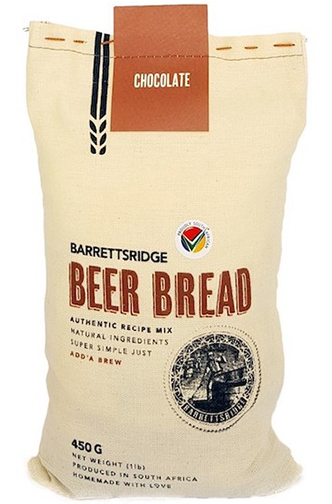 The Barrett’s Ridge bread bakers recommend pairing our chocolate mix with dark lager or stout. Not only do these two brews add to the deep dark colour of your loaf, but they also bring a touch of bitterness only the world’s best chocolates are known for. Top your Barrett’s Ridge Chocolate beer bread with Nutella. It doesn’t get more decadent than this as the nutty Nutella complements the hops in the dark lager or stout. Add extra texture and flavour with berries and nuts.